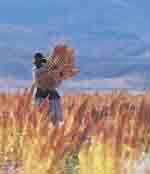 "Quinoa - This extraordinary grain has been a cultural anchor and a staple in the diet of millions of people throughout the Andes for thousands of years . . . and is now poised for global recognition”. Chenopodium quinoa, is native to Peru. While often described as a grain, this food is actually the same family of vegetables as beets, chard and spinach. It was considered a sacred crop by the Incas and, more recently, classified as a "super crop" by the United Nations because of its high protein content. It is a complete protein, which means it contains all of the nine essential amino acids. It also contains the amino acid, lysine, which is essential for tissue growth and repair. This versatile food is a good source of copper, iron, magnesium, manganese and phosphorous. 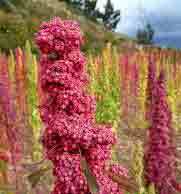 When the United Nations Food and Agricultural Organization decided to make 2013 The Year of Quinoa they did much to raise the profile of this super food that had been a staple in the Andes for thousands of years. The Bolivian government was behind the initiative, which was supported by the other Latin American countries. They argued that this super food was the ideal food to held nations prone to famine because of its high nutritive value and biodiversity, making it an ideal tool for promoting global food security. The plant has since introduced into several African nations that are facing food insecurity. All very well and good, you might say, but what can Quinoa do for me? Nowadays many health food buffs are promoting this South American staple as one of the super foods which can provide many health benefits and help us to optimize our diets. Health conscience people who are struggling to lose weight or simply maintain their current weight, can help their cause by simply replacing rice and pasta with this substitute, as it is highly nutritious, high in proteins and other nutrients, but low in carbohydrates. Gluton-free, this plant is also a useful substitute for people who are allergic to wheat and need to avoid any foodstuffs containing gluton. High in anioxidants and anti-inflammatory phytonutriants, it can also be a useful tool for anyone who is trying to age well. It contains 12% to 18% of protein, making it more nutritious than actual grains. It has high levels of unsaturated fats. It contains high levels of minerals like iron, magnesium, copper, manganese and phosphorus. The problem with this relatively new superfood is that it is unfamiliar to many of us who have little or no idea of how to cook it. However, it is actually very easy to prepare and is a highly nutritious addition to our diets. 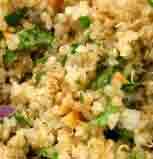 Perepare as you would rice and serve in dishes such as pilaf, serve as a side dish or use in salads. It can also be enjoyed at breakfast, as a substitute for cereal, with milk or yoghourt, fresh fruit and nuts and grains. By adding this delicious alternative to rice and pasta to your diet, you can boost your weight loss, without feeling you have eliminated cereals from your diet.